Does anyone have any advice on getting into the practice of Religio Romana on a day-to-day basis? 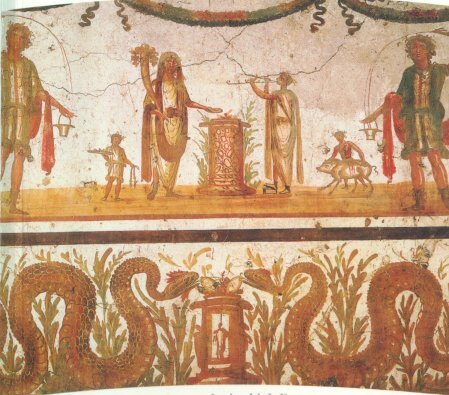 I own Classical Living, and it seems to match what is said in the Correct Form of Lararium Ritual thread, but that's about in terms of resources for modern practice. Also, I know there is this website: http://www.religioromana.net/dailyworship.htm . I still need to read a lot of it, though. And still need to read a lot of other books, too. Are there any books that could be said to be essential for practicing and understanding Religio Romana? With limited funds, I'm trying to figure out what books I need to own before others as I have several reading lists for Religio Romana and thus lots of options (all from the net with several books mentioned in other posts on here). Are books geared specifically towards Hellenic Pagans at all useful or are the systems and beliefs just too different? Anything else that would be helpful that I haven't thought to ask about that could benefit a novice? By the will of the Gods, one thing that has gone without hitch is my larariun. Creating it has been easy for me, and fun. One thing I recommend is checking consignment stores for items. Since I've been doing runs, I've found Greek ceramics (decorated vases) and statues (Apollo & Daphne and a small unknown terra cotta of a Roman woman sitting with her chin on her hand, wrapped in her stola with it covering her head) all for much cheaper than what you would find for discount online (i.e. $10 versus $40). Also, much of my research in these past couple of months have focused on Greek religion as well as Roman. I've noticed some surprising similarities, but essentially Roman/Italic religions were distinct from the Greek ones. As for pouring of libations, offering food, and sacrifices, they're the same, however, so on that front of honoring the gods, both should give you sound advice. Oooo the third image is the one that I used for my own lararium. Here's a question about it: it later occurred to me that it's a lararium for a business, so is it still okay to use even though it's in the wrong context? 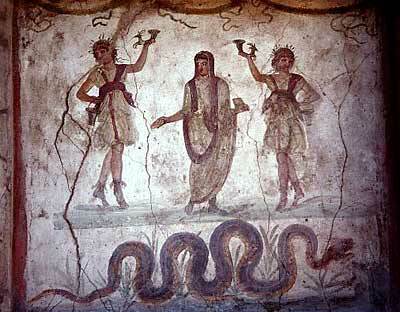 I ask because there is Mercurius on the far left and Bacchus on the far right. I just googled it now and indeed it was in a thermopolium (doh!). That's good about the Greek/Roman offerings being similar. I'm currently reading Greek Relgion and it has good information on that. So basically, you're not limited to just cakes, wine and incense? Oil and water and first fruits can be offered as well? I'm no expert on this sort of thing; not even a practitioner--more a Seeker and interested observer. But, besides historical accuracy, I wonder if the spirit in which the gift is made could be of some importance? If that's the case, you might be able to offer respect to the Gods with almost anything that means something to you, or that you've specially set aside for Them. They must be tickled that anyone even has a lararium these days; I doubt They'd be too picky about what was painted on it. By "Greek Religion" you mean Burkett's? If so, that's a great text. I highly recommend it. Also try to get Beard, Price, and North's Religions of Rome (or something similar to that title). It's also top notch. So sorry for being so short, I'm extremely busy at the moment. Marius - What a good point! I didn't stop to think of that. Valerius - Yup, that's the one. And just purchased Religions of Rome now. Thank you for recommending it. Don't worry about being short in your response. As a single mom, I know all about being busy, especially unexpectedly so at varying times of day and night heh. And...I just realized SVR's Religio Romana page is full of information. Will definitely go through it all. The Collegium Religionum section of the Web site is largely (as in, "almost all") the work of M Horatius Piscinus, who was our Pontifex Maximus early on, and is still considered so by most everybody. That's besides being bisconsul when we had Consuls, a Senator for as long as we had a Senate, one of the first Curatores, and still a iurisconsultus and Curialis. In Nova Roma he goes by M Moravius Horatianus Piscinus and has just completed a lively term as Consul there. He was also Tribunus Plebis there a few years ago, Flamen Carmentalis, and Pontifex Maximus as of last fall. Yes, our go-to person for Religio matters, and a busy and very productive Romanus wherever he finds himself! Piscinus sent me a message yesterday saying that he has had a series of attacks and will be taking some time away rallying his strength. Please keep a good thought for our comrade and pontifex maximus. Di Deaeque nos semper ament. They are both long-time amici of mine. I ask that anyone who feels comfortable doing so send prayers and incense skyward on their behalf. I really hope, by the will of the Gods, that he gets better. I just scrolled through the introductions again and saw that he was the one who had wrote that his family considered themselves Roman, and said they were from southeast of Rome. I used to think I was the only one whose family had that tradition and was looking forward to speaking with him. The closest I've ever come to talking to someone from a similar background was a streghe from Sicily who could only confirm that my family's surname was Roman as all else was secret/handed down knowledge. M Horatius Piscinus' essays are really well-written--scholarly--and very helpful (just read some last night). It is my belief that he could easily publish something on the subject, or one like it, if he so desired. Much respect to someone that is so educated and able to productively juggle a number of responsibilities with skill. May the Gods watch over him. While I was not fortunate enough to have been born in Florida, my bother and sister were. I still have family in Florence now. Ciao, bella! Sometimes I feel like I always miss the critical notices! What can we do but offer those prayers? Valesce, Marce Horatii Piscine! Inmortales Deos Romae precor ut celeriter vires tuas recuperes! Valerius - That's still really cool. I would love to go to Italy one day. Claudius Iohanes - If you don't already, use the links at the top that say like "View active topics" and then just glance at the author and date. That makes finding new topics a lot easier. Also the other options like your topics and new topics help too.